If you like this free game, try Farmington Tales 2: Winter Crop. Welcome to Farmington! 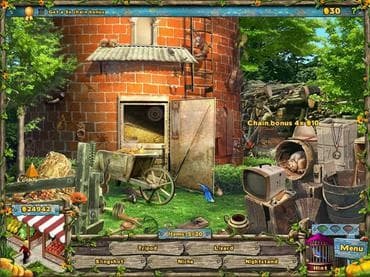 Let's get farming in this unique Hidden Object Farming Sim hybrid!Plant crops, nurture animals, and run the farmer's market! Search the farm…hidden objects are random so no scene is ever the same! Complete quests and hang out with a quirky cast of folk. Build upgrades like a silo or bridge! Plow, plant, water and harvest the perfect crop, even eggs, milk, and wool!Dozens of puzzles and trophies to earn as you save the farm! Free Game features: - Explore picturesque Dahlia Farms; - Hidden objects change each time you play a scene; - Grow fruits and vegetables in real-time; - Innovative quest system; - Expansive farm with over 75 upgrade choices. If you have questions about Farmington Tales game, please contact us using this form.